This post has been sponsored by Vital Farms. All thoughts and opinions are my own. Thank you for supporting the brands that keep Kroll’s Korner running! 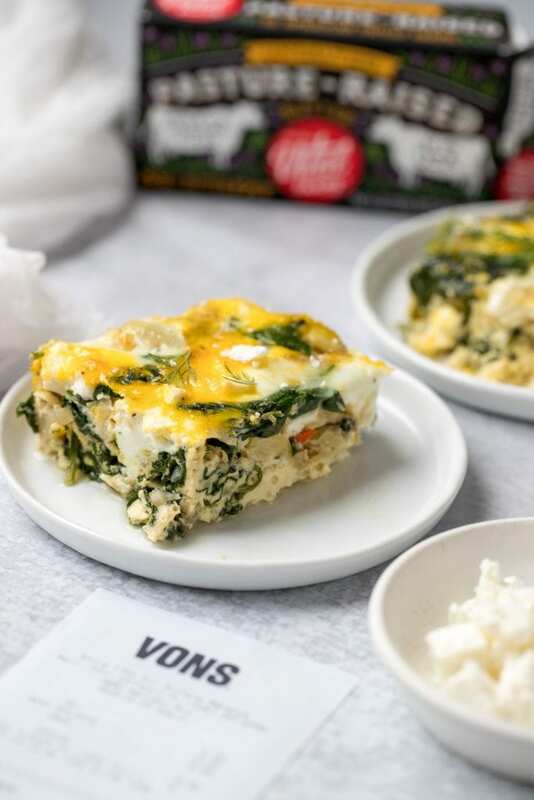 Overnight Spinach & Artichoke Egg Bake: a favorite because it is filled with simple veggies, eggs, and is totally gluten free and a great vegetarian breakfast option! As many of you may know, I do the majority of my grocery shopping at Vons! 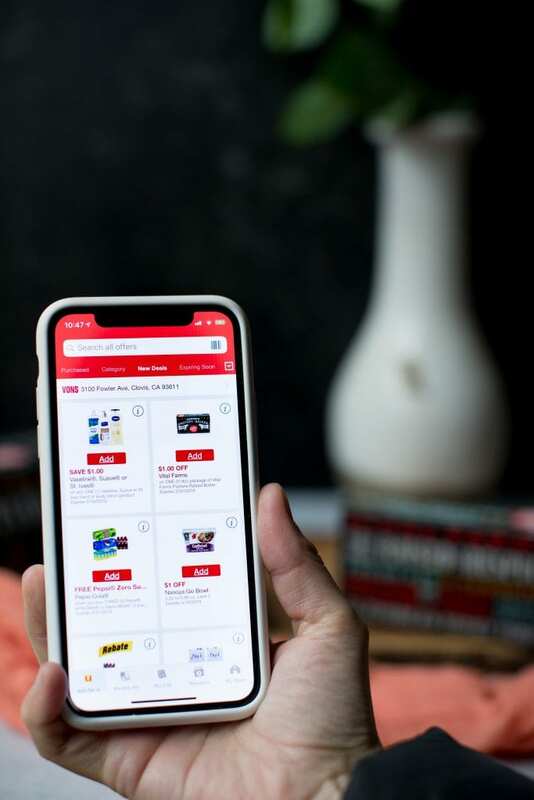 Before I head to the store, I use my Vons app and head directly to the Just 4 U coupon category page. People often ask me what kind of eggs I buy. I’m hooked on the Vital Farms Pasture-Raised Eggs these days. Have you bought Vital Farms Eggs before?! The color of their yolks alone are glorious! I mean, see for yourself. Shopping at Vons is so convenient and easy, and everything is always so fresh! My first stop is always the dairy section, which is where I bought my Vital Farms Eggs and Butter. I think the Vital Farms chalkboard aesthetic packaging is so creative! That cage-free hens only get about 1 square foot of space and spend their entire lives indoors…that’s BS if you ask me. Vital Farms pasture-raised hens get 108 square feet and roam outside on real pastures year-round! 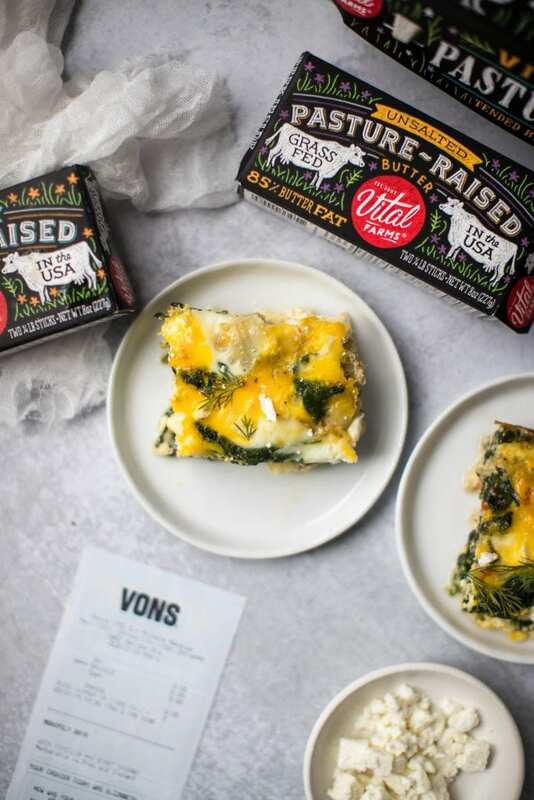 I also used Vital Farms Pasture-Raised Unsalted Butter (they also sell Vital Farms Pasture-Raised Sea Salted Butter) in this overnight egg bake. – Their cows are pasture-raised and their hens/girls have the freedom to forage outdoors year round! – Most of the big brand butter comes from cows that spend their entire lives on concrete, but Vital Farms pasture-raised butter comes from contented cows living as nature intended—free to roam and graze their green pastures to their hearts’ content! Amen. Have you had Vital Farms Eggs or Butter before? Let me know what you think of it in the comments below! Best part? You bake it all in ONE PAN. 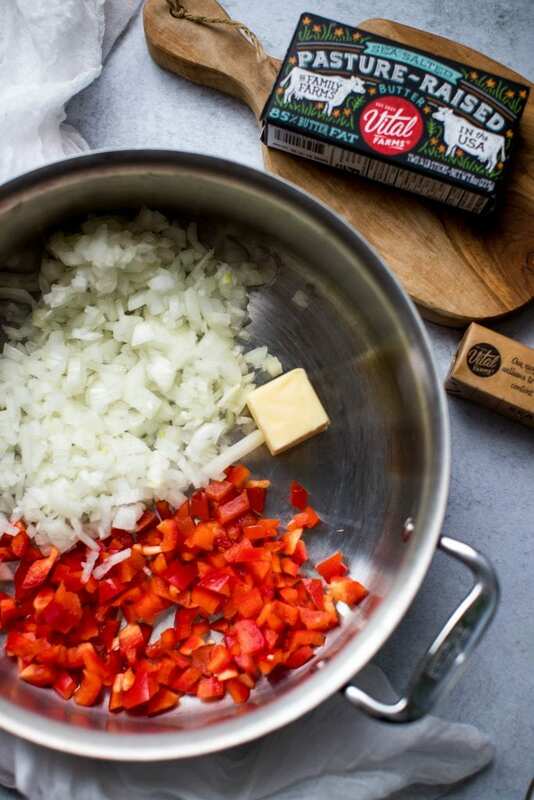 – Sauté your veggies in a frying pan with Vital Farms Unsalted Butter. Stir in the artichokes, and then set the veggies aside. – In a large bowl, crack the eggs. Add in the milk and seasonings, and whisk until eggs are completely broken up. – Using the Vital Farms Unsalted Butter, butter the bottom of an 9×13 baking dish. Layer the veggies down first, and then pour the egg mixture on top. – Top with the cheese and herbs and bake! Easy peasy! 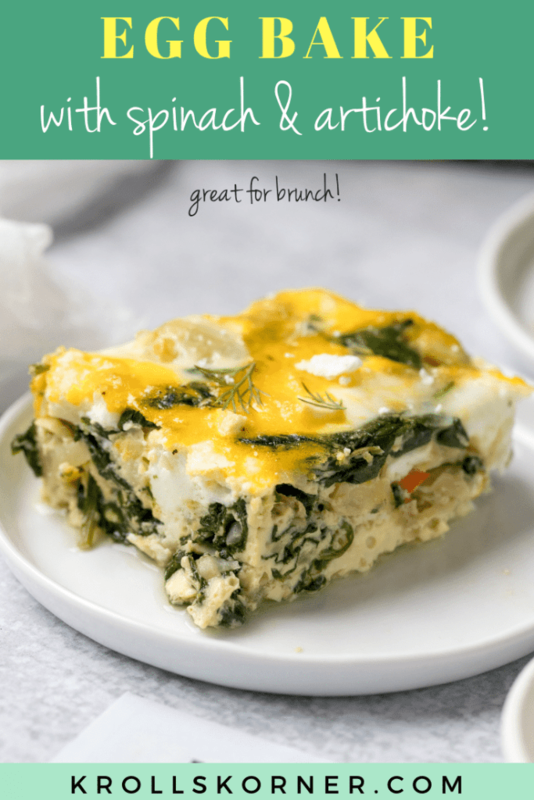 A weekend favorite because it is filled with simple veggies, eggs, and is totally gluten free and a great vegetarian breakfast option! Butter a 9×13 inch baking dish with 2 Tbsp. 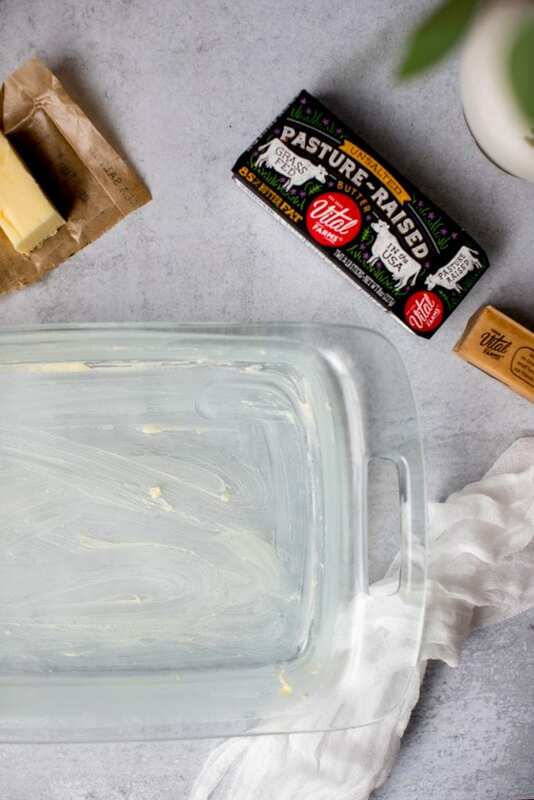 of the Vital Farms Butter, set pan aside. In a large sauté pan, melt 2 Tbsp. butter and sauté the bell pepper and onion for about 5 minutes. Season with salt, and then add in the garlic and fresh spinach until the spinach cooks down. Remove from heat and stir in the chopped artichokes and fresh dill. 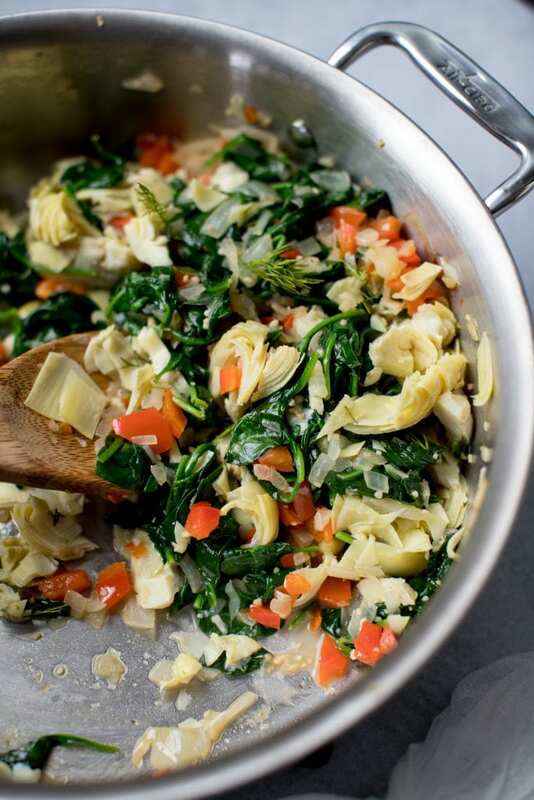 Place the veggies down in a single layer into the prepared pan. 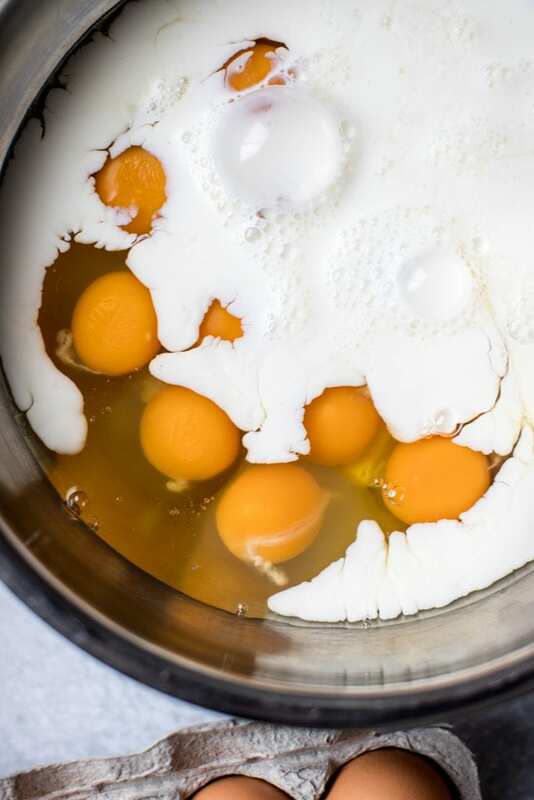 Crack 12 Vital Farms eggs into a large bowl. Add in milk, salt, and pepper whisk together until eggs are completely broken up. Pour the egg mixture over the veggies. Cover with plastic wrap and place in fridge for at least 2 hours or overnight. (Or cook right away in an oven preheated to 375 degrees F.) In the morning, preheat the oven to 375F. Remove plastic wrap. Top with feta cheese and bake for 40-45 minutes or until eggs are cooked. Enjoy with more feta and fresh dill on top. 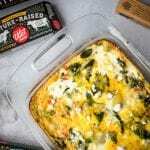 PIN THIS Overnight Spinach & Artichoke Egg Bake FOR LATER!